On April 1st Swarthmore revealed its newly formed geology department, surprising most students and faculty. The geology department made its first and last formal announcement that they would be drilling for “liquid gold”, which turned out to be free coffee for the student body, outside of the Science Center. The announcement was accompanied by a pumpjack outside of the Science Center. In the midst of the sea of work that continually berates students, engineers still come together and stay up until 4 a.m in order to execute the beloved prank. With the combined effort of engineering majors and minors from all different class years the prank was built and set up in less than a day. While the rest of the campus was asleep, the engineers came together to give campus a laugh and some coffee to jumpstart their day. Rome wasn’t built in a day, and while the engineering prank was slightly smaller than Rome, it also took quite a bit of preparation. Andrew Taylor ’16, who is the nominal head of the Swarthmore Society of Engineers, elaborated on the process and effort that went into planning and preparing the prank. “We started brainstorming about 2 months before, this time. We had a series of public meetings that all engineers — even freshmen — were invited to,” Taylor shared. What is even more impressive is that each year the prank is an entirely original project conceived of by the group of students. Engineers come together to brainstorm and collaborate for the yearly prank to create something new. 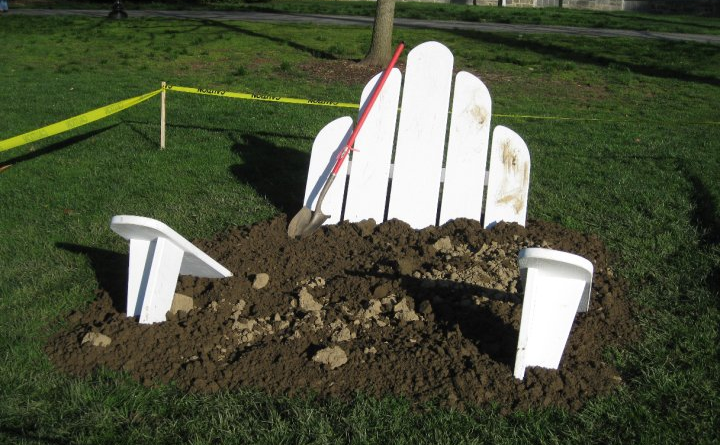 Taylor said that the pranks used to follow the common theme of incorporating the big adirondack chair into the prank, but it hasn’t been incorporated for the past four years. 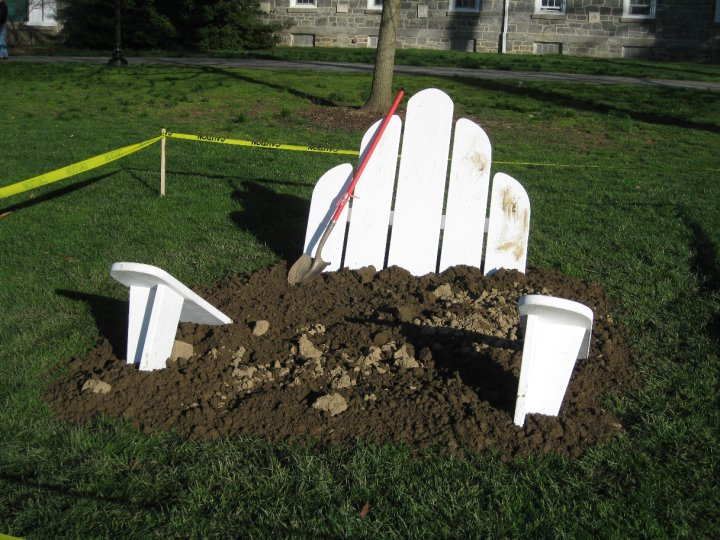 The chair, while not a product of the engineering students, was built by a Swarthmore student during his time here, and has a backstory just as quintessentially Swarthmore as the engineering prank. Jake Beckman ’05, a studio art major who went on to earn his Masters of Fine Arts at the Rhode Island School of Design, built the chair as an installation art project in 2002. In 2008, after many seasons of wear, tear and repair, Beckman worked with Vice President of Facilities Stu Hain to build the more structurally sound, permanent version of the chair. In addition to being an elaborate and time-consuming tradition, the engineering prank strengthens the bonds of the engineers across class years, according to Taylor. “[It’s] a chance for engineers of different years to spend time working on a fun project with each other, and to give people a chance to build something fun,” Taylor commented. Taylor’s favorite aspect of the prank was its multifaceted nature and it’s humor. “I’m proud that it is both funny and a little timely — as well as that it can be interacted with,” Taylor said. An anonymous sophomore didn’t quite agree with what was chosen for the prank and felt like it didn’t really live up to what had been done in the past few years. “I think it was too complicated an idea for a funny prank. I had to try to explain it to too many people,” he shared. Taylor elaborated on pranks that happened in the past which were more overtly funny. “When I was a sophomore, I helped plan and build an extension of a then-infamous sculpture — the Crum Creek Meander — into and through Sharples,” Taylor said. For last year’s prank, the Engineering students constructed the shell of a fake dormitory in the middle of Mertz lawn. Like this year, students worked through the night (to the dismay of some Mertz residents who were kept up by the sounds of construction) to erect “Anfänger Hall,” complete with a sign that announced its planned opening in 2017. While the anonymous sophomore didn’t agree with the decision for the prank, he agreed that the tradition brings engineers together and allows them to socialize and meet people they wouldn’t otherwise interact with. “As a physical object it was pretty cool and I’m pretty proud to have made it…. I think the department could really benefit from building projects like the prank since they help underclassmen meet older engineers,” he said. Julius Miller ’19 participated in the prank for the first time and shared the feeling of excitement and enjoyment that came with coming together as a group and spending hours to complete the prank. “Working on the engineering prank as a freshman was truly incredible. I’m always amazed by how when a group of people put their minds together they can get something done,” Miller said. The prank also serves as a learning opportunity for engineers who haven’t yet worked on a large scale project that required a sizable group of people or used power tools. “For me, it was especially valuable since it gave me the chance to learn how to properly use power tools and observe how crucial planning is in engineering, “ Miller shared. The engineering prank remains one of the many quirky and beloved traditions that many Swarthmore students look forward to. The prank creates a unique environment for engineers to come together and bond, while simultaneously challenging themselves and amusing the Swarthmore community.